Our research’s aim is to assess the effect of cultural factors on business ethical decision-making process in a Western cultural context and in a non-Western cultural context. 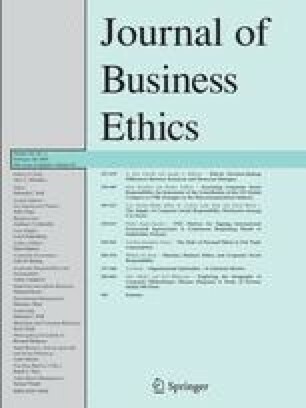 Specifically, this study investigates ethical perceptions, religiosity, personal moral philosophies, corporate ethical values, gender, and ethical intentions of U.S. and Moroccan business managers. The findings demonstrate that significant differences do exist between the two countries in idealism and relativism. Moroccan managers tend to be more idealistic than the U.S. managers. There is a strong positive relationship between religiosity and idealism. There were mixed findings in examining the correlates of religiosity and various components of ethical intentions. Moroccan managers were more homogenous in their corporate ethical values than were the U.S. managers. The results demonstrate that (in general) idealism is a good predictor of ethical intentions and behaviors. Additionally, managers from the two countries differed in the degree of relationship between perceptions and intentions in three of the four scenarios. This study’s results confirm other research findings that, in general, female business managers have higher ethical sensitivity in terms of their ethical judgment than their male counterparts. Managerial implications are also discussed. business ethics moral personal philosophies decision making social responsibility culture executives Morocco U.S.
1.Department of MarketingWestern Connecticut State UniversityDayburyU.S.A.